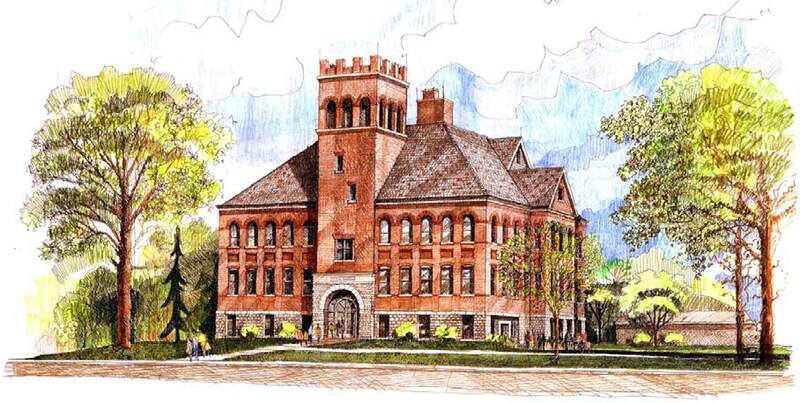 Historic Landmarks Foundation of Indiana asked Architura to prepare a schematic design to renovate an extremely dilapidated 1870’s high school in danger of collapse. Designed for conversion into a community and cultural center, the facility contains a library as well as a small museum with exhibits dedicated to James Dean and Garfield creator Jim Davis. An entirely new steel structural frame has been carefully inserted and incorporated into the historic structure. A new building envelope has been created as well, replete with new historic windows and slate roofing. The basement contains the new entry arriving from the bermed and hidden new parking lot. The renovation comprises entirely new mechanical, electrical, plumbing, fire protection, air conditioning and utility infrastructure. The third floor original stage and auditorium will be renovated to near original appearance. The 20,000 square foot project anticipates a completion date of 2007 at a cost of 4 million dollars.